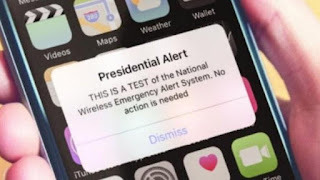 Washington DC - More than 200 million cellphones in the United States (US) suddenly get 'Trump Alert' notifications. What is that? The notification is apparently a trial conducted by the Federal Emergency Management Agency (Fema). The warning is a system for a number of emergencies such as missile attacks, terrorism and natural disasters. "This is a national wireless emergency alert system test. No action is needed"
Even though the name is 'President Alert' or a warning from the President, the message is not sent directly from the president. The government through FEMA designed it and sent it if there was an emergency. "The president did not write this warning from his cellphone. You are not in a situation where the president got up early and sent a similar message," a senior official in Fema said. Initially a cellphone warning was scheduled for last September but was canceled. Because at that time there was a storm in Florence and it was feared to make people confused. 0 Response to "200 Million Cellphones in the US Suddenly Get President Trump's Warning (Presidential Alert)"